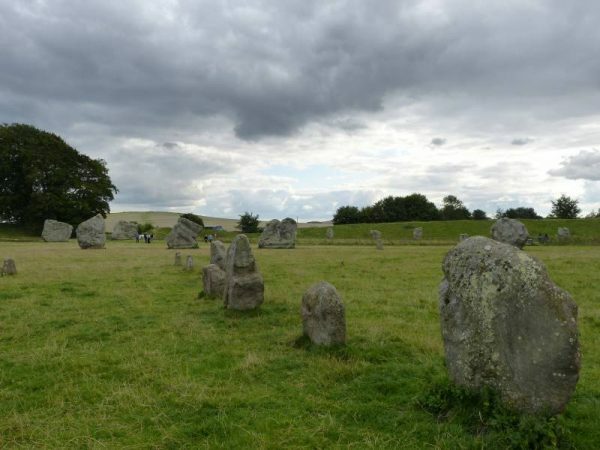 Oldbury Tours provide full and half day tours of the Avebury region. 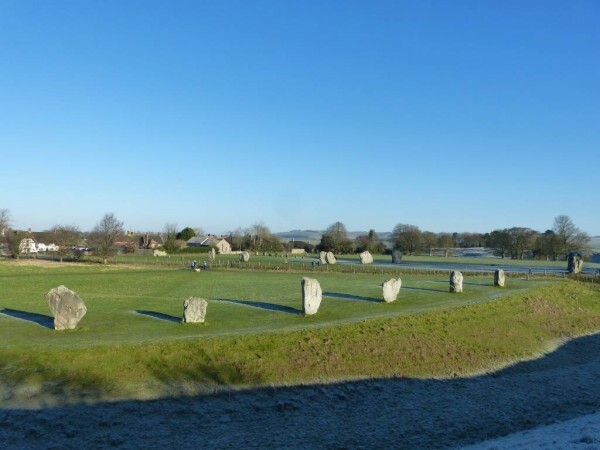 To enquire about a tour with our local expert Avebury guide please click on the ‘Enquire’ button or follow the link here. Avebury stone circle is the largest stone circle in Britain and lies ‘at the centre of one of the most remarkable concentrations of Neolithic and early Bronze Age archaeology in western Europe’ (Gillings and Pollard 2004). 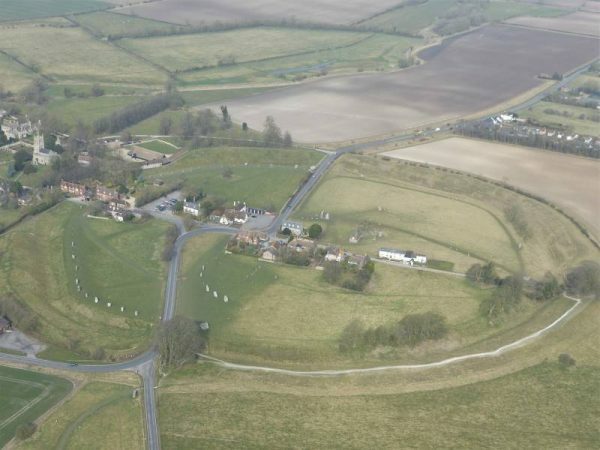 As with so many of the monuments in this World Heritage Site Avebury was constructed, used and remodelled over an enormous period of time from about 3,000 BC for something like 1,000 years. There is much to tell of its development over this time and of the antiquarians and archaeologists who have excavated and interpreted it over the past 350 years since its ‘rediscovery’ to science in 1649. The whole monument is enclosed by a roughly circular bank about 420m in diameter up to 30m wide at its base and still over 5m above the present ground level. This surrounds an equally extraordinary ditch which was originally between 7 and 10 metres deep! It is still impressive diving down nearly 4 metres from ground level. Four gaps, whether entrances or exits, interrupt the henge at the cardinal points. There are three other ‘super-henges’ in the region, at Durrington Walls, Marden and Mount Pleasant, but this is the most impressive to visit. The others don’t have stone settings. As part of a full day tour I can take you to Durrington Walls and Marden henge as they both lie in between Avebury and Stonehenge. Inside this chalk and earth structure is a circle of what was originally about 98 massive, naturally shaped sarsen stones and within this further stone circles and features in varying degrees of preservation and restoration. I say ‘about 98’ sarsen stones because many of the original stones were removed, destroyed or buried during the medieval and later periods and only two of the four quadrants have been excavated. Inside this circle of huge stones are the remains of two inner circles of about thirty stones and the truly mega Obelisk and Cove which provided the centre pieces of the inner circles. There are also some smaller sarsen stones within the southern of these inner circles that recent work suggests might be the oldest part of the monument. Up until now the ditch and bank have yielded the earliest carbon dates but it is odd that all the other super-henges were built to enclose an established area of activity. Maybe Avebury at last conforms to this pattern. 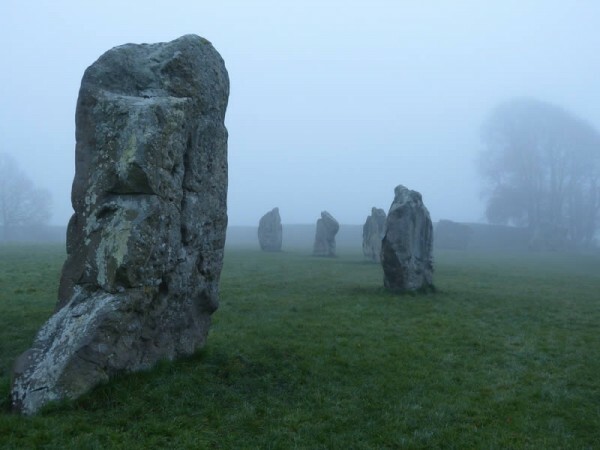 In the 1930s an extremely wealthy man called Alexander Keiller, who had made his money from the Scottish marmalade trade, bought Avebury Manor and its estate including the Neolithic monument and decided to restore the stone circle to its ‘original’ state. Fallen stones that lay prostrate on the surface were re-erected. Where he found buried stones he resurrected them and if there were only empty sockets in the chalk bedrock (as evidence of removed stones) he placed concrete markers to show the missing stones’ previous positions. The Second World War and financial pressures brought an end to Keiller’s project and as a result only half of the circle was restored. The full number of stones can therefore only be surmised from the results of geophysical surveys and from what has been restored. 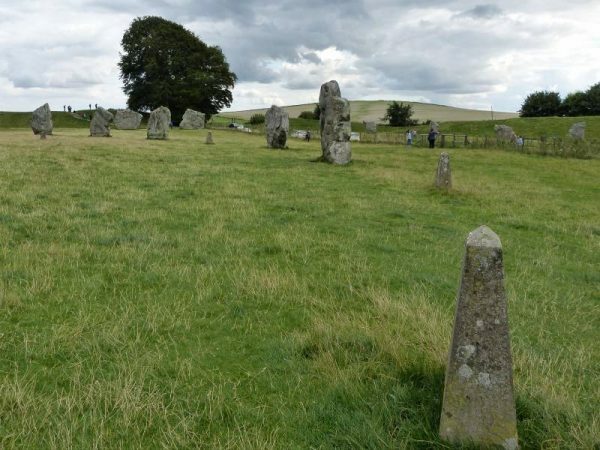 My first visit to the great henge and stone circles of Avebury was as a primary school pupil at Preshute School in Manton and I remember how fascinated we all were particularly by the tale of ‘the barber-surgeon’. Believed by most experts now to be a tailor from the 14th century, due to the hinged iron scissors found with him, his skeleton along with his few belongings were found buried below the collapsed stone 9 of the outer circle. Handily for the archaeologists he had three silver pennies on him dating to the reigns of Edward ii (1307 – 1327) and Edward iii (1327 – 1377) so his burial presumably dates from the reign of Edward iii. 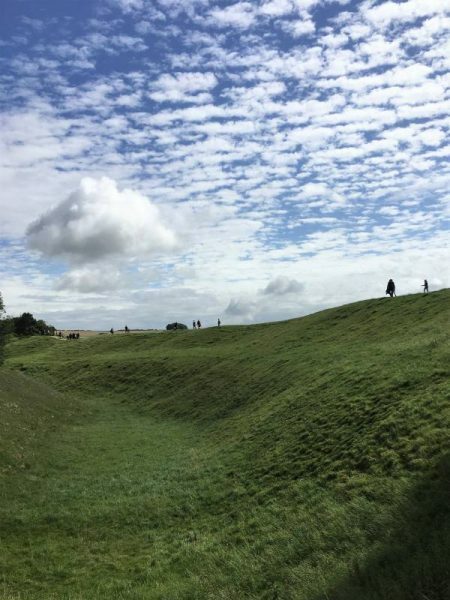 After that Avebury became something of a playground and regular picnic spot for me and my family, my brother and I careering up and down the bank and ditch as children still do today. In contrast to the stone settings at Stonehenge there is nothing to stop anyone from getting up close and personal with the Avebury stones at any time of day. As an integral part of the village the stones share the landscape with people going about their daily business along with day visiting tourists and local families such as us. Instead of detracting from the importance or value of the site I think it is rather better to see this as a continuation of the stone-human relationship. Our interpretation is undoubtedly different from those who conceived and built this ancient monument but it still inspires a sense of wonder and is even still a sacred place to some. Of course since this monument was constructed in the depths of prehistory we can only guess its original purpose. Excavation can tell us the order of construction, bank and ditch and then about 500 years later stones. However, there have been few finds here compared to other sites of a similar age in the area. There is no evidence of feasting on a colossal scale as there was at Marden and Durrington Walls for instance where huge amounts of Grooved Ware pottery and animal bone were recovered. At these two sites then we know at least some of the behaviour of the people that frequented them. Avebury is different, comparatively very ‘clean’ of evidence. 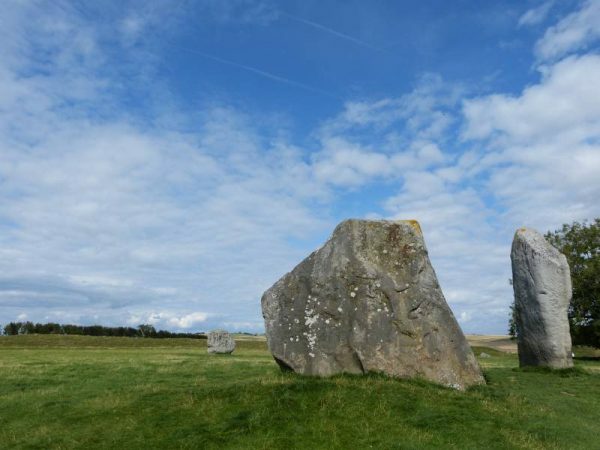 As Mark Gillings and Joshua Pollard say in their book on Avebury ‘every generation has had to confront and interpret it’, and that ‘contemporary views rarely agreed’ (Gillings and Pollard 2004). 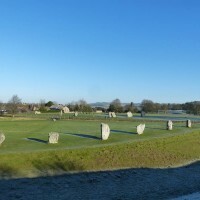 Towards the end of Avebury’s construction period at least two and possibly four stone avenues were created leading out of the circle to connect it to other Neolithic sites in the area. One of these avenues the 2.4km long West Kennet Avenue once led to ‘The Sanctuary’, another circular monument this time of stone and timber on Overton Hill. This avenue of huge stones was also much restored by Keiller and is now once again very much part of the site. 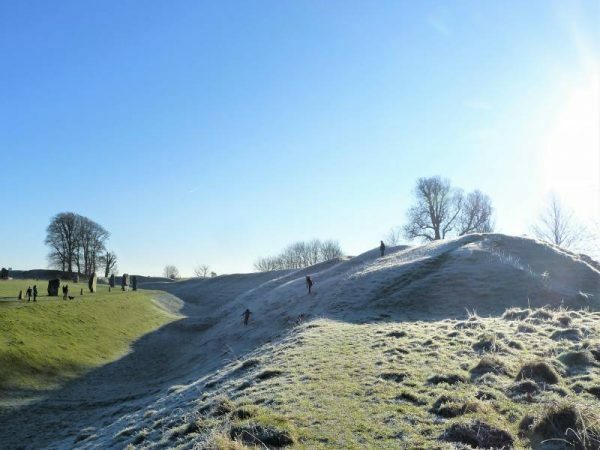 Also nearby are the famous sites of Silbury Hill and West Kennet Long Barrow and many other lesser known and in many cases hidden places of ancient significance. You really need an Avebury guide to understand how all these monuments relate to each other. Please enquire about a tour to include Avebury via the ‘Enquire’ button below or for more information click on ‘Home’ for our home page, ‘About’ for our story or ‘Tours’ for suggested itineraries. Read more about the Avebury area here. For a different perspective you can fly over the area in a fixed wing light aircraft with Tony Hughes of The Wiltshire Microlight Centre. Follow this link to book a twenty minute or half hour flight or click on their logo.